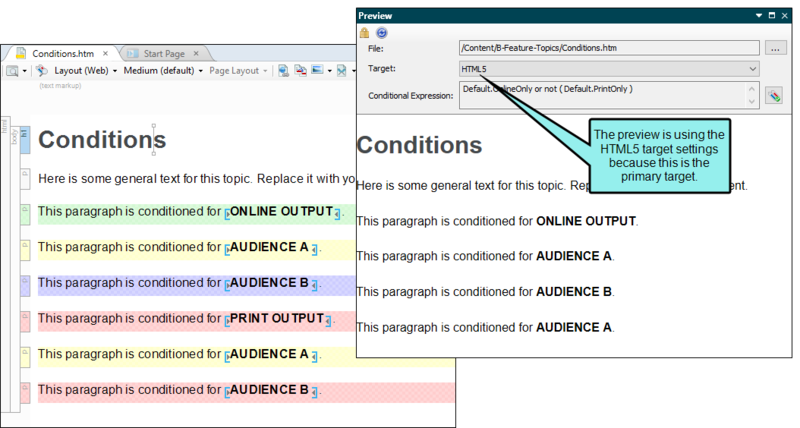 You can quickly see how a topic (as well as a snippet or master page) will look in the final output by previewing it. The Preview window pane is dynamic, allowing you to keep the preview open while you work and see changes as you make them in the XML Editor. 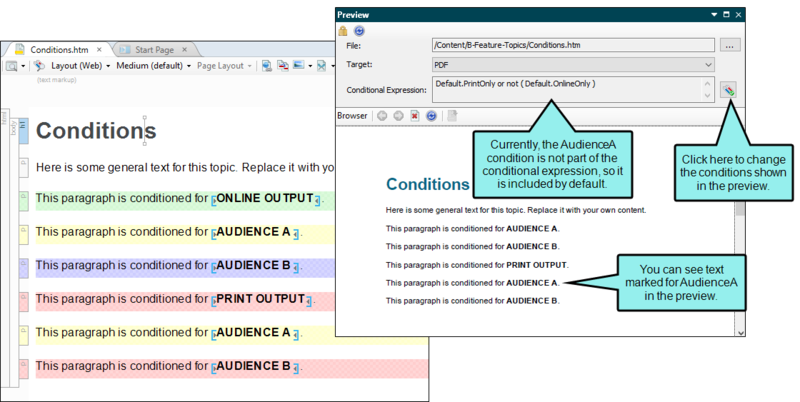 You can preview the topic based on the output format used in any of the targets in your project (including conditions that are set for that target). You can also preview a file based on specific conditional expressions that you choose. 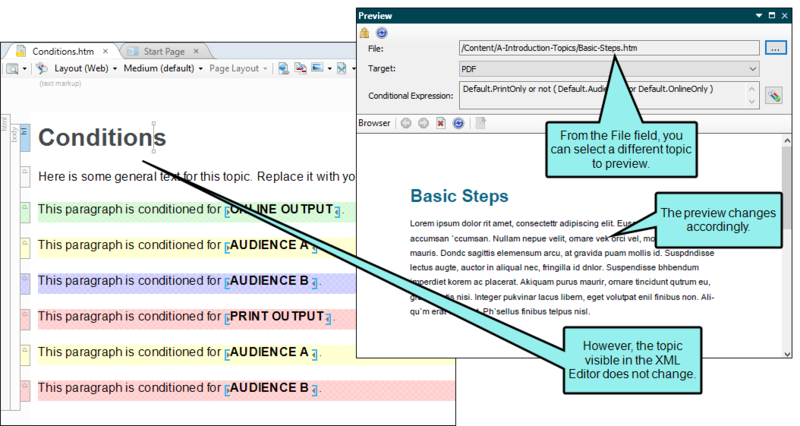 A content file (i.e., topic, snippet, master page) is opened. A change is saved in the XML Editor. The refresh button in the window pane is clicked. The File, Target, or Conditional Expression fields in the window pane are updated. 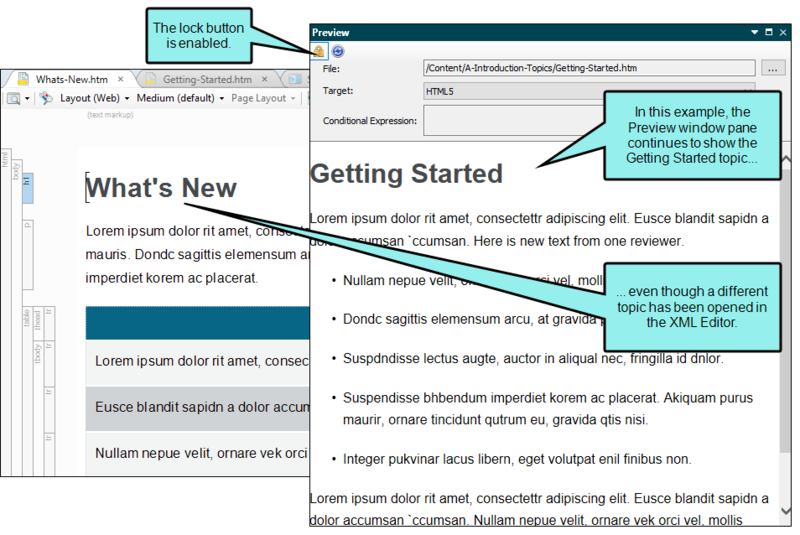 Local Toolbar Open a topic, snippet, or master page. Then in the local toolbar of the XML Editor, click . If you click the down arrow, you can choose a target; otherwise, the preview opens according to the settings in the primary target (e.g., with the appropriate conditions already applied). 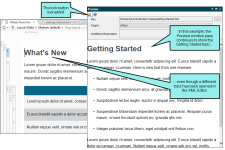 Ribbon Open a topic, snippet, or master page. Then open the View ribbon and select Preview Window. Like the button in the local toolbar, this option also has a down arrow from which you can choose a specific target. 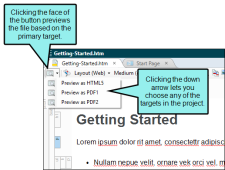 Right-Click To preview a topic, snippet, or master page that is not open, you can right-click the file in the Content Explorer and choose Preview. The Preview window pane opens using settings for the target you selected. (Optional) By default, the Preview window pane will be floating. If you want to dock it to the interface, click the title bar and drag it over a region identified by different squares. Then drop the window pane on the appropriate square. See Customizing the Workspace. (Optional) You can continue editing the file. As you save your changes, the preview will automatically update. If you want to preview a different file from the current one, next to the File field click and select the topic, snippet, or master page you want to preview. The file opens in the Preview window pane. From the Target drop-down, select the target you want to use for the preview. When you select a target, the current preview changes accordingly, showing the content using the condition tag settings in that target. When you preview for a specific target, the condition tags set for that target are automatically used in the preview. 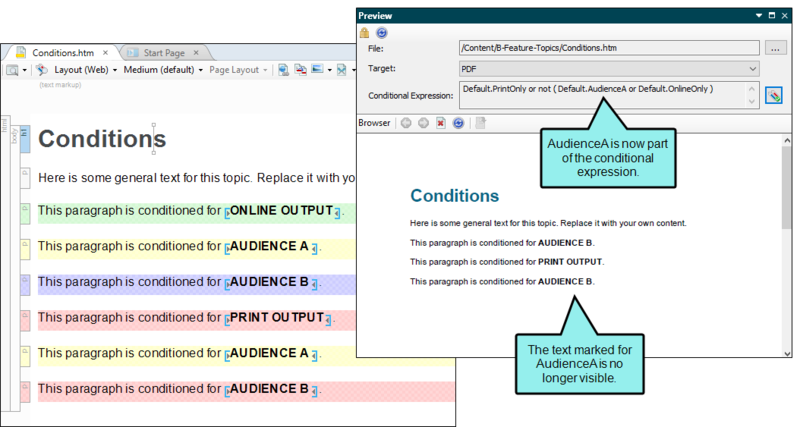 However, you can also preview your content with different condition tags included or excluded. For example, you might find this useful if you’ve added a new condition to the project and want to see how some topics will look once that condition is included or excluded. Rather than changing the target file, you can test the condition in the Preview window pane first. Flare will remember the manual condition as you open one content file after another so that you do not need to select the condition each time you move to a different file. 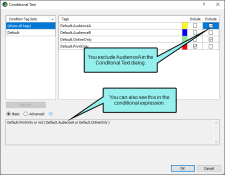 Next to the Conditional Expression field, click . The Conditional Text dialog opens. Select the condition tags you want to include or exclude. Conditions already set in the target are set by default. Either the Basic or Advanced mode is already selected, depending on which mode is being used in the target. 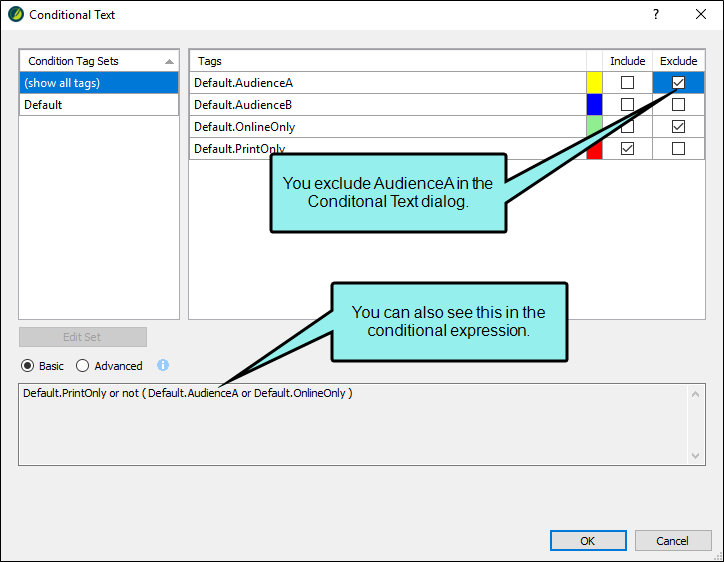 For more information about the Basic and Advanced modes, see Creating Basic and Advanced Tag Expressions or Associating Conditions with Targets. Note: Changes in the Preview window are not transferred to the target settings. They're simply temporary so that you can see what a topic looks like with certain condition settings. (Optional) Click in the local toolbar to refresh the Preview window pane. This ensures you are seeing the most up-to-date content in the window pane. (Optional) Click to lock the Preview window pane. By enabling the lock button, you can continue to show the preview for one topic while opening other topics in the XML Editor. Click the X in the top-right corner of the Preview window pane to close it. Let's say you are working on a topic. 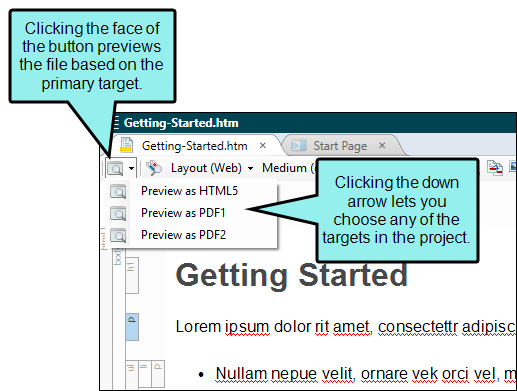 You want to use the Preview window pane to see how the topic will appear using different settings in your project. 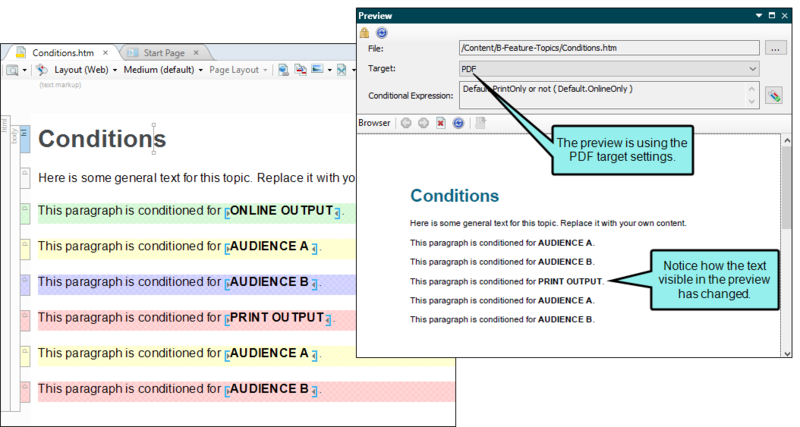 Now you want to see how the topic will look when you build the PDF target. You select the PDF target from the Target drop-down. The preview changes to reflect the new settings. Next, you want to see what would happen if you excluded the AudienceA condition in the PDF target. You click the Conditions button and make your changes in the Conditional Text dialog. After you click OK, the preview settings change, and AudienceA is excluded. Finally, you want to preview a different topic than the one currently open in the XML Editor, so you select that topic in the File field. The new topic opens in the Preview window pane. Note: The preview feature is useful because it is a quick way to see how a content file looks in the output. However, there may be times when you need to generate the entire target and test the output. For example, you might want to see how topics look when integrated with master pages or tables of contents. See Testing Output.